CEO of the Green Building Co.
مرفق أدناه رابطين لثلاث مقابلات مع الدكتور محمد الحاج حسين مع قناة سي ان بي سي ارابيا عن فوائد استخدام البوزلان الطبيعي من البراكين في الخرسانة الخضراء والعزل الحراري والبلوك الاخضر والمباني الخضراء في السعودية والخليج العربي وجميع دول العالم التي لديها براكين طبيعية . تعتزم السعودية إلزام كافة مشاريع البناء الكبيرة والمباني الحكومية والشركات تطبيق كود البناء الأخضر. برنامج بالاخضر يسلط الضوء على هذا الموضوع من خلال مقابلة مع الدكتور محمد تاج الدين الحاج عضو اللجنة الفنية الخليجية للمباني الخضراء. Dr Alhaj Hussein is a certified Saudi consultant civil engineer having over 10 years of professional experience at his own engineering consulting office in Jeddah, Saudi Arabia. Dr Alhaj Hussein is a confirmed international expert in corrosion control, green concrete and other green building materials, products and technical methods. Dr. Alhaj Hussein heads training and engineering research for the Saudi Green Building - and the Saudi division of the Concrete Science Technology. He is also a member of the Gulf Green Building Technical Committee (TC6/SCI). Dr Alhaj Hussein is a member of the American concrete International of ACI 232 and ACI 240 Committee for the use of Fly ash and Natural Pozzolan in the concrete. Also he is member of the American concrete International of ACI222 ( corrosion of metals ) and ACI 555 ( the use of recycled concrete) In the framework of his scientific contribution, Dr. Al Haj Hussein has presented various seminars and published many articles in Russia, USA, Saudi Arabia, Gulf, UAE, Kuwait, Jordan. During his professional activities, he was interviewed by the international Medias on CNBC, Gulf TV,Saudi radio and Kuwait radio. Dr Alhaj Hussein has acted as a speaker, moderator and a conference chairman for many summits and specialized conferences of green concrete, green building and construction waste management. 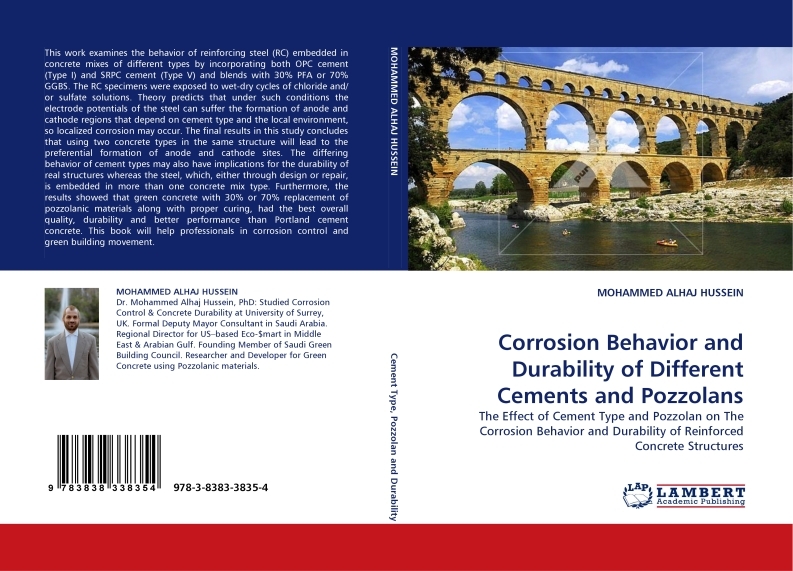 Dr Alhaj Hussein is the author of The Effect of Cement Type and Pozzolan on Corrosion: Behavior and Durability Performance of Reinforced Concrete. His PhD's dissertation book is now widely sold in Europe, North America and Asia. classes of civil engineering students.